Meno a Kwena's nine private tents are luxurious and classy but not over the top—just like Prince Harry and Meghan Markle. Each tent is perched on a 100-foot high clifftop overlooking the river, and adorned with locally-woven fabrics mixed with colonial-style furniture. Meno a Kwena sits on a prime site for wildlife watching; located on tribal land on the western boundary of the Makgadikgadi Pans National Park, the camp offers expansive views of the beautiful Boteti River. Being the only permanent source of water for miles, the Boteti attracts a rich array of resident wildlife including elephants, wildebeests, and zebras. 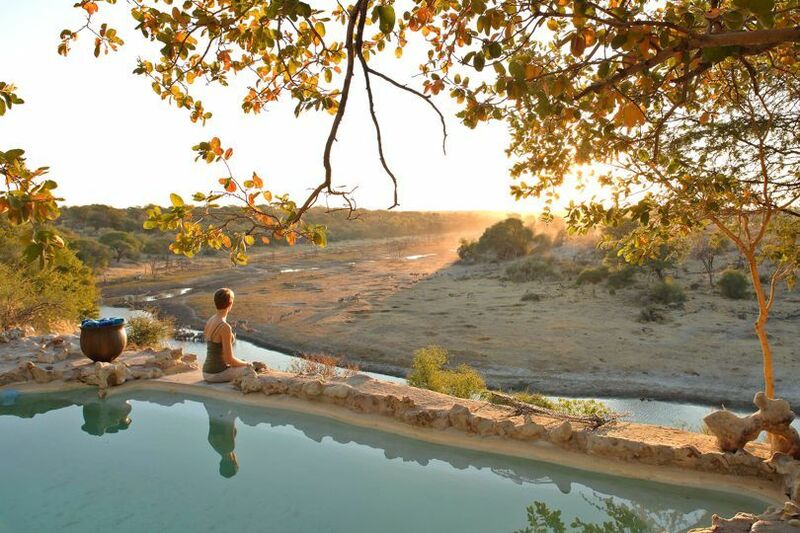 Marvel at wild Africa in action, from the comfort of your tent or from the earthy infinity rockpool. Fun fact: this past January, Prince Harry became a patron of Rhino Conservation Botswana. Meno a Kwena offers year-round game drives in Makgadikgadi Pans National Park, where baobab trees dot the area's shimmering expanses of crusted salt for as far as the eye can see. For a more lush landscape, explore Nxai Pan National Park for a chance to spot cheetahs, lions, gazelles, and more. Other activities that can be arranged include bush picnics, boat trips, and cultural walks with local San bushmen. Prince Harry apparently loves the laid-back, unassuming feel of Meno a Kwena, where all meals are cooked over an open fire and, weather permitting, served outdoors. Breakfast, lunch, and dinner are prepared with fresh ingredients by on-site chefs and served group style unless you wish to dine privately, which can be easily arranged. For the ultimate romantic experience, guests at Meno a Kwena can request to sleep out on the Pans for a night—just like Prince Harry and Meghan Markle did on their trip. “It was I think about three, maybe four, weeks later that I managed to persuade her to come and join me in Botswana, and we camped out with each other under the stars," Prince Harry shared in an interview. "It was fantastic."